Built on Webpack, Redux and React Router. Would you like to be notified as new features and docs are released? Sign up! Thanks! We'll email you when there are noteworthy updates to Lore. Lore contains blueprints for common actions and reducers that it configures using the frameworks conventions. 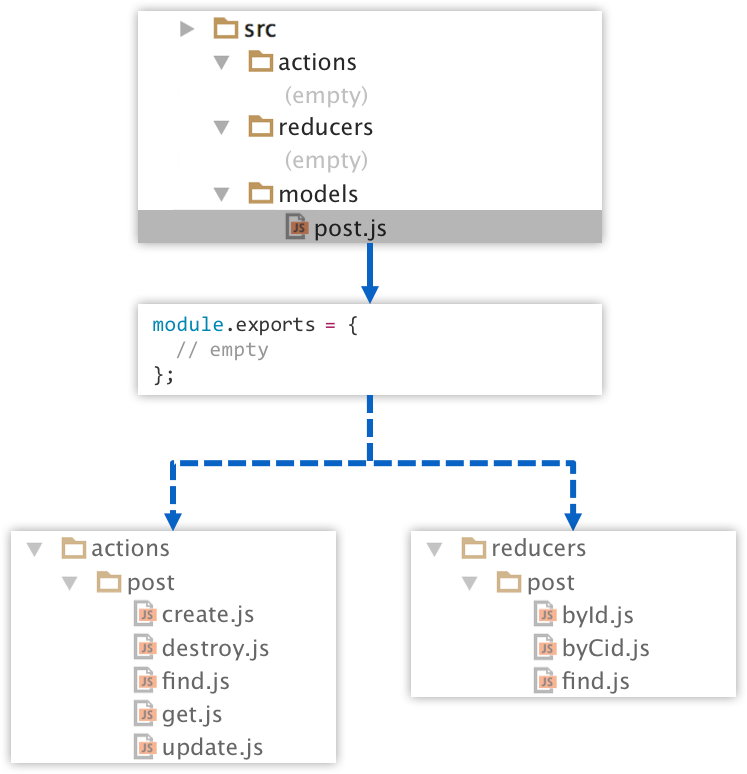 By creating a model, Lore provides access to a set of actions and reducers capable of supporting common CRUD operations, which can then be configured or overridden as required. Then fetch data just by declaring it. Lore provides a simple decorator that allows you to declare what data your components need. If this data exists, it will be provided to your component. If it doesn't, Lore will automatically call the required action and inform your component when the data comes back. Just install the CLI and create your project. Everything you need is already included, and the project comes preconfigured with supporting for building, routing and publishing your project. For each of the libraries Lore is built on, we looked at what were the most common tasks and challenges in working with them, and then integrated functionality into Lore to improve that experience. Behavior for all libraries can also be easily tailored through simple config files. Easily create new projects using Lore's CLI, preconfigured with everything you need to get started building React applications. Learn more. Lore uses conventions to provide overridable blueprints for actions and reducers, along with a decorator that allows components to declare the data they need. Learn more. Lore automatically mounts the application to the DOM, and subscribes the app to the store so components automatically update when data changes. Learn more. 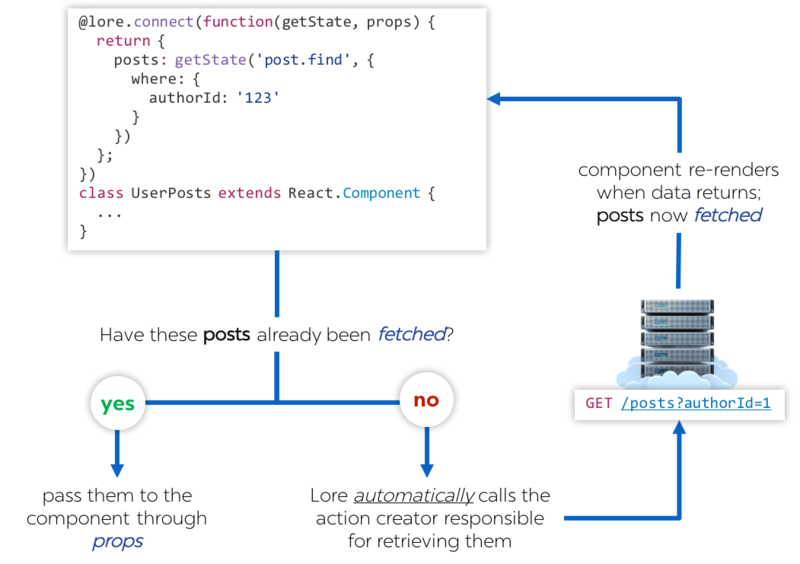 React-router preintegrated into project, easily configured, and routes are clearly exposed at the root of the project. Learn more. Common loaders pre-installed in config with a modular setup that allows you to override the Webpack config on a per-environment basis. Learn more. Provides a built-in (but easily deleted) script for publishing to Now, an excellent static hosting provider that provides free SSL certs and enables zero-downtime deploys. Learn more. Thoughtfully designed to support features you'll needas you're app grows. Lore is serious about building scalable apps. The architectural patterns in the framework are taken from years of building diverse applications, and designed to solve not just the needs you have today, but the ones you'll have tomorrow as well. Enables data-driven components by supplying components with both data and context. Learn more. Layered communication tier able to communicate with multiple API servers and capable of adapting to changes in data contracts. Learn more. Useful for viewing a subset of data that matches a specific criteria. Learn more. Useful for moving through large datasets, and providing the user with a sliced view of the data. Learn more. Mobile friendly style of pagination that aggregates fetched data into a single scrollable list. Learn more. Add support for real-time updates through simple configuration, and make a big improvement to the user experience of any team-based application. Learn more. Easily discover and communicate when data is being updated, fetched or contains an error. Learn more. Makes your application feel snappy and responsive by assuming server calls will be successful. Learn more. Helpful utilities to automatically mount, configure and display dialogs. Learn more. Easily discover when the server confirms data creation before moving onto the next step. Learn more. Server errors are passed to components and clearly communicated. Learn more. Discover and communicate when resources can't be found. Learn more. Would you like to be notified as new features and docs are released? Lore is a convention-driven framework for React, built with love by @_jchansen and @mikrofusion, to help you launch your ideas sooner and scale them into legend.